The spruce fir moss spider is a species of spider known by the taxonomic name Microhexura montivaga. It is perhaps best known for its status as an endangered species. The spiders only live in a few locations in the mountains of Tennessee and North Carolina. They are found on moss mats in Fraser forests where they build tube shaped webs. 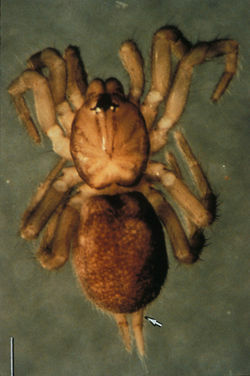 The spider is classified in the infraorder Mygalomorphae and is closely related to the tarantula. Despite its relation to the tarantula, the spruce fir moss spider is small. It only reaches a few millimeters in length. The basic anatomy of the spruce fir moss spider is similar to that of most spiders. Its body is divided into two segments, the cephalothorax and the abdomen, and it has eight legs used for movement. The appearance of the spruce fir moss spider is fairly unimpressive. The spiders are various shades of brown, usually light brown or dark reddish brown. They have no abdominal markings. Although most people think of tarantulas as large spiders, spruce fir moss spiders are actually quite small. They usually measure only about three to four millimeters long. Spruce fir moss spiders have many structural characteristics that distinguish them from other spiders. They have two pairs of book lungs for respiration instead of one. Spruce fir moss spiders also have chelicerae, which are appendages that arachnids use to tear food with, that extend past the carapace. The carapace is the dorsal section of the spider's exoskeleton. Spruce fir moss spiders also have one pair of spinnerets that are unusually long. Spruce fir moss spiders reproduce oviparously.When the male spruce fir moss spider matures, which is typically in September or October, he develops tibial spurs and elongated legs to protect himself from the female's fangs when they mate. The male then leaves in an attempt to survive and hopefully be able to breed again.The female usually lays the eggs in June. The egg sacs are thin-walled and clear. An egg sac usually will have about seven to nine eggs. The spruce fir moss spider can be found in western North Carolina, eastern Tennessee, and southwest Virginia. It lives in the Southern Appalachian Mountains at elevations of about 5,400 feet or higher. Its habitat is forests of Fraser firs with a few red spruces. These forests are called spruce fir forests. The spiders normally live on damp moss mats that grow on rocks or boulders. Their tube-shaped webs can usually be found between the moss mats and the boulder. A damp, shady environment is necessary for the spruce fir moss spider's survival. It is extremely susceptible to desiccation, or drying out. However, large drops of water can also pose a threat to the spiders. Therefore the moss mats that they live on cannot be too wet or too dry. Although the spiders have never been seen eating prey in the wild, they most likely eat spring-tails, which are numerous in the moss mats. Some animals that might compete with or prey upon the spruce fir moss spider include pseudoscorpions, centipedes, carabid beetles, and other spiders. The spruce fir moss spider is an endangered species. There are only a few remaining populations of spruce fir moss spider that survive. These populations are located on Roan Mountain and Mount Buckley in North Carolina and Tennessee, Grandfather Mountain in North Carolina, and Mount LeConte in Tennessee. Of these locations, Mount LeConte appears to support the most stable population. In the other places, the spiders can usually be found in small patches of a micro habitat of moss and rock outcrops. ↑ Microhexura:Taxonavigation Wikispecies. Web. Last modified September 27, 2008. Author unknown. ↑ Porch,and Batdorf. Biology with Laboratory Exercises. South Carolina: Bob Jones University Press, 2005. 480. Print. ↑ Spruce Fir Moss Spider, Microhexura montivaga Red Orbit: Your Universe Online. Web. Last updated on December 7, 2013 . author unknown. ↑ 4.0 4.1 4.2 4.3 4.4 4.5 Spruce-fir Moss Spider in North Carolina U. S. Fish and Wildlife Service. Web. Date accessed: December 7, 2013. author unknown. ↑ chelicerae encyclopedia.com. Web. Date accessed: December 7, 2013. ↑ Holloway,J.E. What Is a Carapace? Wise Geek: clear answers for common questions. Web. Last modified on December 4, 2013. ↑ 7.0 7.1 7.2 7.3 Arachnids Spruce-fir moss spider ENR State. Web. Accessed on December 9, 2013. Unknown author. ↑ 8.0 8.1 8.2 Hodge, David. The Tarantula's Tiny Cousin The Free Library. Web. Accessed on December 9, 2013. ↑ 9.0 9.1 Doddridge, Joseph E. Endangered and Threatened Wildlife and Plants; Designation of Critical Habitat for the Spruce-fir Moss Spider Fish and Wildlife Service. Web. Date of Publication: June 28, 2001. ↑ 10.0 10.1 Spruce-fir moss spider Microhexura montivaga U.S. Fish and Wildlife Service. Web. Last updated on January 11, 2012. Unknown author. ↑ 11.0 11.1 11.2 Spruce Fir Moss Spider Microhexura montivaga Camel Spiders.net. Web.Accessed on December 16, 2013. Unknown author. ↑ Fish and Wildlife Service Designates Critical Habitat for Endangered Spruce-fir Moss Spider U.S. Fish and Wildlife Service. Web. Published on July 6, 2001. Author unknown. This page was last modified on 17 October 2015, at 13:55.